Predictions on the number of connected things worldwide forecast shocking figures for the coming years. Today, there is a widespread agreement that the issue will not only be a matter of managing these billions of connected things but, primary, how to handle and exploit all the data they generate. The immediate response to this challenge has been the emergence of Edge (or Fog) computing. This consists in providing equipment, tools and mechanisms that allow rapid processing of data at “the edge of the network” in a location close to where the data is generated, to avoid unnecessary network transmission to the Cloud and enable near real- time actuation over connected things. However, we foresee these won’t be sufficient to completely address the challenge. Increasingly connected things are becoming not only smart objects but autonomous things including multitude of sensors with growing computing capacities for delivering cognitive tasks. These are, for example, autonomous robots and connected cars. The growth in complexity of these autonomous things, their ever-increasing computing demands coupled with the fact that these are commonly mobile objects, will require that Edge and Cloud computing technologies go a step further in its evolution. We name this foreseen evolution Swarm Computing. Swarm computing combines network and cloud principles to create an on-demand, autonomic and decentralized computing thus taking the functionality and flexibility delivered by IoT ecosystems to a new level. It leverages on existing edge and cloud computing best practice, but with improved focus on mobility with data sharing and temporary control of connected devices. Edge computing and multi-cloud architectures embracing the swarm vision will then evolve into a set of computing and storage platforms able to provide low latency and near real-time responses with security capabilities focusing on both physical and digital entities. According to us the potential two-level polarization between edge and cloud is superseded by the concept of swarm which enables a more advanced cloud cooperation model. 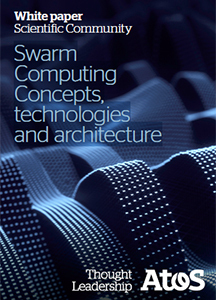 Swarm computing aims to address new business models around digital markets by creating novel opportunities at the intersection between people, businesses and things. Connecting people, devices and services into digital ecosystems has been recognized as challenging but essential for the coming years. New research is required on how to deploy, operate and manage these heterogeneous and highly distributed services, which will require high levels of automation and innovative skills. In addition, future complex digital ecosystems will increase the need for solutions able to adapt to specific user needs at scale in a highly dynamic way.